Arms and the State is a history of Britain's first and foremost modern armaments company, the Armstrong Whitworth Company, from its origins in 1854 to 1914. It focuses on the role of Sir William G. Armstrong, an engineer and entrepreneur who transformed his modest mechanical engineering business into a vast industrial enterprise which invented, developed, manufactured and sold heavy guns and warships throughout the world. Arms and the State reconstructs the global arms trade as it follows Armstrong's companies selling the latest weapons to both sides in the American Civil War, Egypt, Turkey and Italy in the 1860s, to China, Chile and Japan in the 1870s and 1880s, and became Britain's leading armaments company in the age of the naval arms races that preceded the First World War. In so doing, it discusses varied topics such as the social and political nature of technological innovation, the quality of Britain's late-Victorian entrepreneurs, and the impact of armaments on British politics, defence policies, the international arms trade and imperialism. Arms and the State situates the history of the company in its technological, political and international contexts, with particular attention given to the role of British Parliamentary politics and the inner workings of the War Office and Admiralty bureaucracies. The central narrative is Armstrong's role in the militarization of technology in the 1850s, the commercialization of the armaments trade on a global scale in the 1860s and 1870s, and the emergence of the British military-industrial state in the 1880s and 1890s. 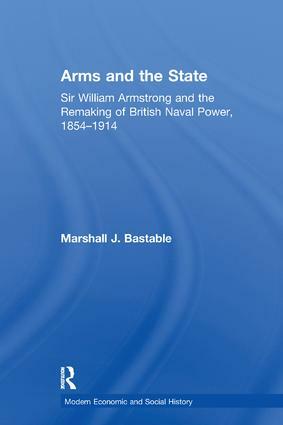 Arms and the State provides a history of the people, the technology and the business of the Arms trade. It is a fascinating story of the domestic politics, the foreign policy and strategic calculations, the manipulation of the press and the bureaucratic intrigues that lay behind the invention, production and proliferation of the first weapons of mass destruction. Contents: Introduction: Theories, models and approaches. Part I Inventing the Armstrong Gun, 1854-65: War, friends and competitors; The naval arms revolution; Defending England: monster guns or iron ships? Part II Making the Global Arms Market, 1863-1914: Introduction; World demand and Elswick's marketing; Arming America and Europe in the age of nationalism; Arming Asia in the age of imperialism. Part III Remaking British Naval Power, 1880-1914: Introduction; The naval-industrial complex; The political-industrial complex; Entrepreneurs, managers and the British state. Conclusion; Epilogue; Bibliography; Index. Marshall J. Bastable is a professor at Acadia University, Canada.